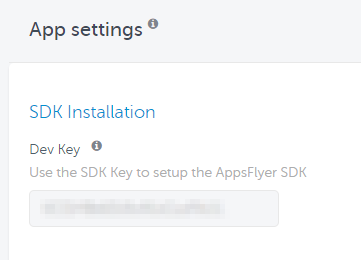 Integrating AppsFlyer's SDK is easy and straightforward. Nevertheless, we highly recommend that you test the integration before submitting the app to the app store. The AppsFlyer SDK is compatible with Android based Smart TVs and Apple TV (tvOS). You can use the instructions in this guide to test the SDK integration for apps developed for Android and Apple TVs. For unpublished tvOS apps, see Testing tvOS Integration Before Publishing. For apps developed for Amazon's Fire TV, see Testing Tracking Out of Store. Why Should I Debug and Test Anyway? Carefully tested integration ensures accurate and comprehensive data collection. By testing the SDK integration, you make sure that installs and in-app events are tracked and attributed to the correct campaigns. So how do I Test and Debug The SDK Integration? There are two ways you can test and debug the SDK integration. AppsFlyer attribution model utilizes tracking links. Conducting tests using tracking links is highly recommended. 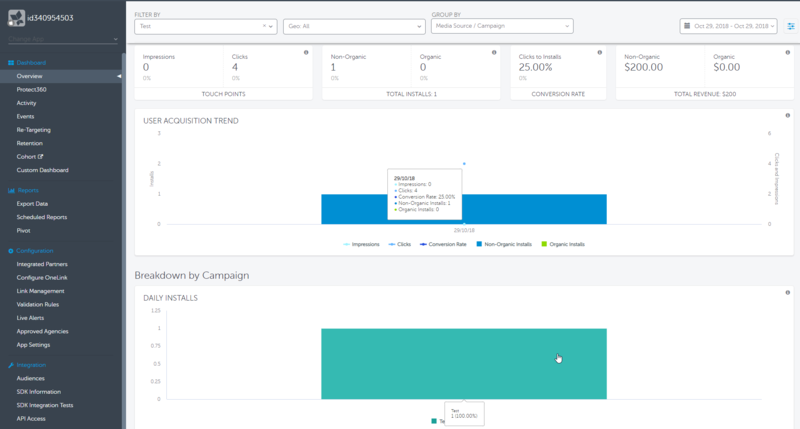 When you test the SDK integration using tracking links you get in-depth insight into AppsFlyer's attribution model. In return, knowledge of AppsFlyer's attribution model and attribution features gives you the opportunity optimize your marketing operation and analysis. The SDK Integration Tests section only tests for a limited set of features. It doesn't cover purchase validation, conversion data and errors in SDK setup. You can test these in the development environment with the help of the debug log. If you are an Ad Network and you want to test your integration with AppsFlyer or with advertisers, see our guide on Ad Network Integration Testing. This section discusses how to create debug apps in order to keep test data separate from real data. If you do not require a test app, or if you are not concerned about mixing test data and real data, you can skip this section. When performing tests using tracking link, data is added in the app's dashboard. Once data is added to the app's dashboard it cannot be removed. If you do not want test data to be associated with a live app, you can test the SDK integration using debug apps. The idea behind debug apps is that they are exact copies of the apps that are published in Google Play or Apple Store. By running SDK integration tests on debug apps, you make sure that test data is not mixed with real data. Follow the instructions to add a new app in your AppsFlyer dashboard. Make sure that the package name is the same as the package name of the newly created test app, and not the original app's package name. Also, make sure to set the app status to Pending approval or unpublished. You can now run tests on the new test app. The app ID is the ID that is given to the app once it is published to the app store. However, since this is a test app, you can give it whatever ID you want as long as it is not taken by another app. The format should be id023412312. Always start the ID with the digit 0 after the id part. See ID example above. iTunes never assigns IDs that start with 0. Setting an app ID that starts with 0 prevents conflicts with existing IDs that are assigned to apps by itunes. Follow the instructions to add a new app in your AppsFlyer dashboard. Make sure that the app ID is the same as the app ID of the newly created test app. Also, make sure to set the app status to Pending approval or unpublished. Once AppsFlyer SDK is fully integrated into your app, you can start testing the integration. This section demonstrates how to test the integration with the help of tracking links. Before you can start testing, make sure to whitelist devices that you use for testing. When testing re-attributions, make sure to remove the device from whitelist. Testing installs allows you to determine that AppsFlyer SDK is able to correctly attribute installs to various media sources. Change the app_id parameter to your Android app id. The c parameter specifies the name of campaign. The pid parameter specifies the name of the media source to which the install is attributed. Add the GAID for Android (Google Advertising ID) or IDFA for iOS. Copy the link, send it to the test device, and navigate to the link using the browser. If the app is live, proceed to install. Allow up to two minutes for the install to appear in the app's dashboard. You should see an install that is attributed to the media source Test under the campaign Test. For a more elaborate verification, you can download the installation raw data report. In the app's dashboard click on Export Data under Reports. In the Raw Data Reports section download the Installation raw data report. Refer to our article about installation raw data report for more information. You can test in-app events to see that they show the revenue that is associated with them, and that they are attributed to the media source that generates the install. After installing the app using the tracking link, trigger a few in-app events. Allow up to two minutes for the events to appear in the dashboard. Open the app's dashboard and click on Events in the left-hand side menu. You should see the events, their revenue (if revenue is associated with them) and the media source with which they are associated. For a more elaborate verification, you can download the in-app events raw data report. In the app's dashboard click on Export Data under Reports. In the Raw Data Reports section download the In-App Event raw data report. Refer to our article about in-app events raw data report for more information. OneLink™ allows you to set a single tracking link for both iOS and Android. OneLink recognizes the user's device and redirects them to the relevant app store. In addition, OneLink enables deeplinking. Deeplinking allows you to open the app in a specific app activity while serving customized content. 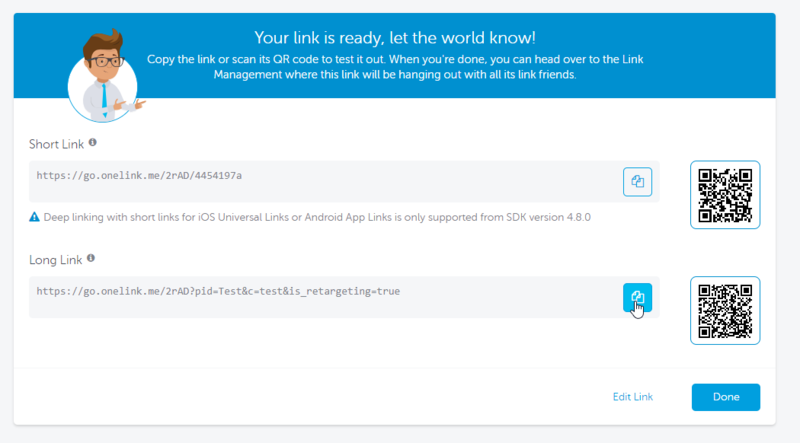 For more information, see our guide on testing OneLink URLs. 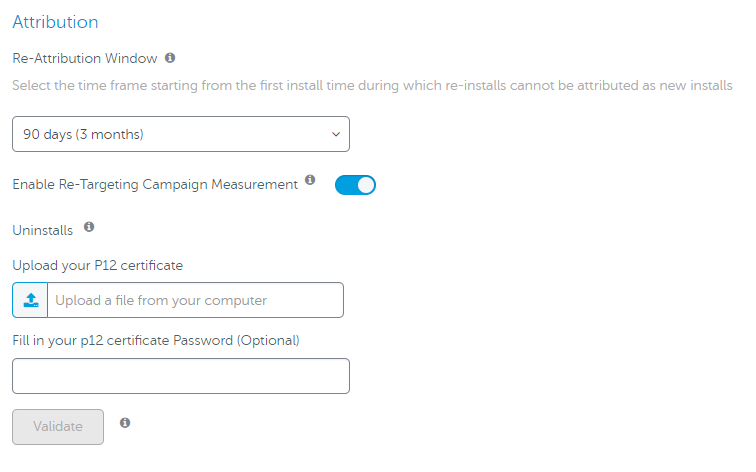 In the app's dashboard, click on App Settings and toggle on Enable Re-Targeting Campaign Measurement. Testing retargeting is straightforward. Create a custom tracking link out of a OneLink template. 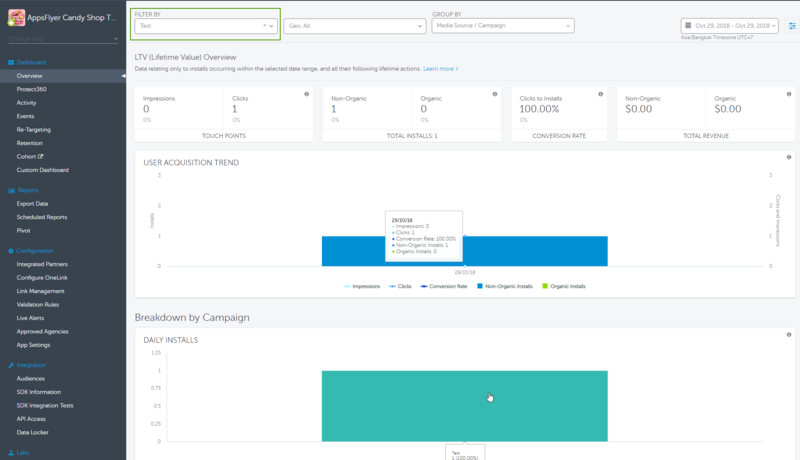 Make sure to toggle on Re-Targeting Campaign. Another way to retrieve the long URL version is through the Link Management page. When testing retargeting (re-attribution and re-engagement), the device ID (GAID or IDFA) must be specified in the tracking link URL. You can get the device ID when whitelisting a device. You can test re-attribution to verify that you can track installs of your app by users who reinstall the app after uninstalling it at some point in the past. For a more elaborate verification, you can download the conversions raw data report. In the app's dashboard click on Export Data under Reports. 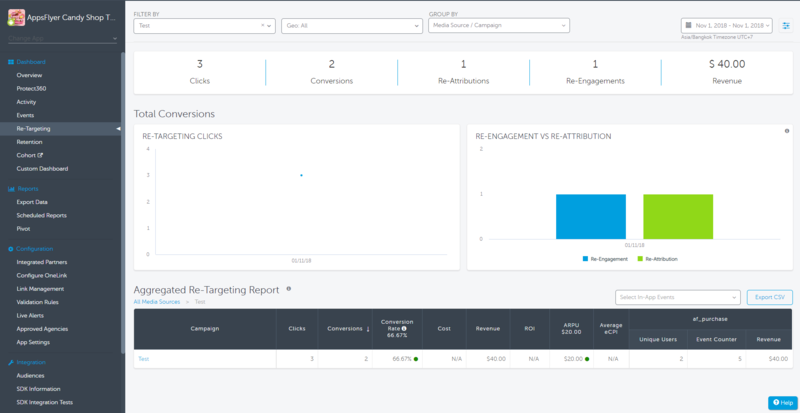 In the Re-Targeting Reports section download the Conversions raw data report. Re-engagement occurs when a user who has the app installed, engages with a retargeting campaign and launches the app. Re-engagement via app open means that the user is redirected to the app store where he or she are presented with an open app button. If they click the open button and launch the app, a re-engagement is recorded. You should see a re-engagement attributed to the media source Test under the campaign name Test. You can test re-engagement attribution using deep linking. It is the same procedure as testing re-engagement with a tracking link. The only difference is that the tracking link contains a parameter af_dp that redirects the user to a specific activity in the app. For more information follow our guide on Testing Deeplinking. This section demonstrates how to debug the SDK. Reference this section to conduct advanced testing and to troubleshoot issues with integrating the SDK. Debugging the SDK gives you an in-depth perspective of how it integrates with your app. Debugging helps you solve issues with in-app event tracking, conversion data, and purchase validation. Debugging should be restricted to development phase only. Do not distribute the app to app stores with debugging enabled. This poses major security and privacy risks. To view the debug output, open the Logcat terminal in Android studio. Choose the application package name as the debuggable process, set the log level to Debug and filter by "AppsFlyer_". You are testing attribution using tracking links. You've implemented the SDK conversion listener but the log always shows that the install is organic. In addition, no non-organic install is recorded in the dashboard. Your dev key is incorrect - if you specify an incorrect dev key, the install cannot be attributed. The tracking link you are using is incorrect. Refer to our guide on tracking links. Make sure that the device you are testing on is whitelisted. You are testing install tracking but the log doesn't show any data about the install such as type, first launch etc. Make sure that the startTracking and init methods are called in the AFApplication class. You are testing in-app events to see that they are attributed to the correct media source. However, the log shows response 404 for both the install and when you send in-app events. Neither the install nor the in-app events appear in the dashboard. A 404 response indicates that the app ID is incorrect. Make sure that the app ID in the applicationId parameter in the build.gradle file is the same as the one in your dashboard. The revenue parameter is not formatted correctly. Do NOT format the revenue value in any way. It should not contain comma separators, currency sign, or text. A revenue event should be similar to 1234.56, for example. You are trying to see in-app events in the log. When you trigger events the log only shows "AppsFlyer's SDK cannot send any event without providing DevKey". You call the startTracking method without passing the dev key as a parameter. Pass the dev key to the method. You are trying to test in-app events in the log. When you trigger events the log only shows "Not sending data yet, waiting for dev key". You call the init and you pass the dev key as an empty string. Pass the dev key to the method. You are trying to test in-app events in the log. When you trigger events you see response 400 in the logs. This might indicate an issue with the dev key. Check that the dev key is the correct one. Also, make sure that the dev key contains only alphanumeric characters. The Log Shows "WARNING: Google Play Services is missing"
The logcat shows the warning message "WARNING: Google Play Services is missing". The app is missing the Google Play Services dependencies. This might prevent the SDK from collecting the GAID which might cause issues with attribution. In the module (app) level build.gradle file. Debugging should be restricted to the development phase only. Do not distribute the app to the App Store with debugging enabled. This poses major security and privacy risks. To view the debug output, open the debug terminal in XCode and filter by "AppsFlyer". If you specify an app ID in the wrong format, installs and events are not tracked. When setting the app ID in the delegate file, make sure that it comprises of numbers only. AppsFlyer Error: appleAppID should be a number! The 404 error indicates that the SDK is unable to find the app in your account. The 400 error indicates that the SDK is unable to authenticate the request to track installs and events. Check that the dev key is the correct one. Also, make sure that the dev key contains only alphanumeric characters. The app contains the correct app ID and dev key but installs are not tracked. The Log Shows "AppsFlyer dev key missing or empty. Aborting"
You are trying to see installs and in-app events in the log. The log shows "AppsFlyer dev key missing or empty. Aborting". You are testing installs and in-app events to see that they are attributed to the correct media source. However, response 404 appears for both install and in-app events. Neither the install nor the in-app events appear in the dashboard. A 404 response indicates that the app ID is incorrect. Refer to Installs and Events are not Tracked. This might indicate an issue with the dev key. Check that the dev key is the correct one. Also, make sure that the dev key contains only alphanumeric characters. Refer to Installs and Events are not Tracked. 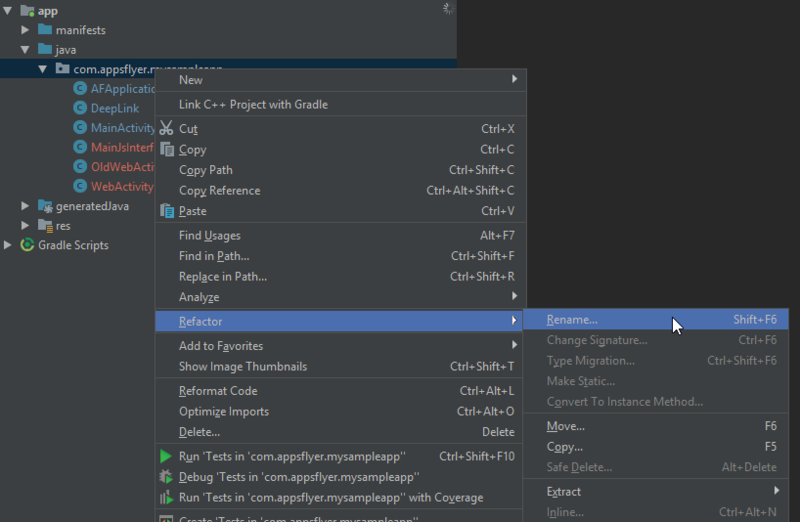 Viewing the debug output is done through Android Studio or XCode.